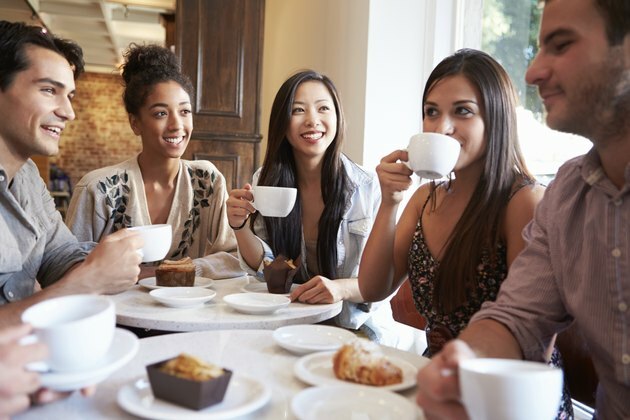 Drinking tea is popular for many reasons, and the benefits can vary from one tea to the next. Steeping dried herbs in hot water allows the nutrients they contain to soak into the tea. The caffeine in certain teas can trigger indigestion, but some teas do not contain any caffeine and may actually help treat indigestion. These teas are not made from tea leaves but instead from herbs steeped in hot water. Indigestion can result from many factors or a combination of multiple influences. In some cases it is simply the result of eating too much and/or too fast. Alcohol, carbonated beverages, fats and greases, chocolate and spices are all possible dietary triggers of indigestion. Other potential causes of indigestion are gallstones, peptic ulcers, nervousness, trauma and some medications. A common component of tea that can cause indigestion is caffeine. Excessive consumption of caffeine can lead to indigestion. Although moderate amounts are less likely to upset the stomach, your personal sensitivity to caffeine could increase the tendency to develop indigestion. Black tea is often high in caffeine; according to the University of Maryland Medical Center, black tea has about two to three times the amount in green tea. In some cases, tea can calm a troubled stomach and alleviate indigestion. Peppermint tea, University of Maryland Medical Center experts say, is an herbal remedy that has been used to help treat indigestion. Peppermint calms the stomach muscles and improves bile flow, allowing food to more rapidly leave the stomach and enter the small intestine. The effects of a specific tea on digestion vary from one person to the next. If you suffer from chronic indigestion, talk to your doctor or a nutritionist about the types of tea that will be least disruptive to your system. You should also consider eating food along with your tea to help lessen the effects of the tea in your stomach. You may also want to consider herbal teas like chamomile or lemon balm; provided they are not produced from tea leaves, teas made from herbs do not contain caffeine. Decaffeinated black and green teas are also available, allowing you to enjoy the flavor of teas without suffering side effects. HealthGuidance.org: What Foods Cause Frequent Indigestion?